This is a fun story about a boy in today’s time. His parents teach him awareness of living to take care of our earth but he also wants to learn about modern ideas; he especially wants a computer. His journey teaches him about how technology gives us a deeper understanding into the universe. 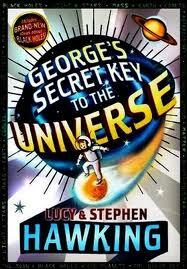 The book has lots of fascinating excerpts on stars, planets, etc. For the blossoming scientist, it is a great blend of fact and fiction. My son of age 9 especially loved this. My 11 year old daughter liked it too. It was very relevant for our family because we try to make careful choices about the environment and we limit our children’s exposure to computers. So it was fun for them to read about a boy in that same situation. What a wonderful discovery this children’s book is, in so many ways. As a work of fiction, it makes great reading, with plenty of humor and drama all the way through. However, add to that the scientific accuracy of the genius of Stephen Hawking, and you get an irresistible combination for any child who has an interest in science, physics, astronomy, or just ‘how did it all begin.’. One thing I like about this children’s book of fact and fiction is that some of the scientific information is extracted into separate pages, for those readers who really want to dig into science facts. It’s also filled with amazing photography of stars, planets, and the stuff of the universe. I also love the theme of taking care of earth, and the message about using science for the good of all. We can’t hear that often enough. This children’s book is fairly easy to read, so I think any child over 9 can stay with it. It probably takes an older reader to gather all the scientific stuff, if they wanted to. With a boy main character, it’s definitely a good read for young boys. Thanks to Jasmine for putting me on to this.